Hundreds of papers have been published about CTA science and technology. Use the library tool below to sort and search CTA scientific and technical papers. For CTA Consortium research funding agencies, go to the Acknowledgments page. The updated Consortium authors list can be accessed from the Authors page. The CTA Consortium Publication Policies can be downloaded here: PDF, 317 KB. Questions concerning the publication of CTA-related materials should be directed to the Chair of the Speakers and Publications Office (SAPO): Vitor de Souza. 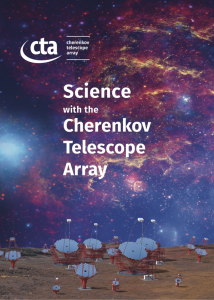 A collection of 24 publications describes CTA and its science potential for various areas of high-energy astrophysics.